Russell Westbrook crossed the line. The Oklahoma City Thunder star has dressed as a debate team captain in all-print button-ups, a metal head, and the odd man out of a barbershop quartet. He’s inched closer to the line with every one of these outrageous outfits, and this entire playoff run he’s been holding his foot above the line wiggling his toes. You can’t argue with the last point. The reckless abandon Westbrook plays with has also seeped into his dressing and landed him on everyone’s radar during the Thunder’s run to the finals in the 2011-12 season. Fast-forward to 2016, and it feels as if Westbrook is merely in a game of one-upmanship with himself—and if we know anything, it’s that he hates to lose. The Thunder star’s fishing lure polo, by Lacoste, fed blogs plenty of content when he wore it back in 2012. If Westbrook were to wear that now, we might hardly notice. Case in point is Kevin Durant&apos;s outfit, an equally colorful Nintendo-themed Moschino shirt the same night Westbrook wore his ripped T-shirt. And did you hear a peep about Durant’s “eccentric” fashion choice? Not really. It seems that Westbrook has now painted himself into a corner: If he wants us to keep talking about his clothing choices (which, make no mistake, he does), he has to keep pushing the boundaries further and further. A colorful shirt alone no longer shocks us, but we’d love to talk about the latest bizarro scraps of threads thrown together that’s masquerading as clothing on your body. That is my biggest beef with Westbrook&apos;s style. You can try and hit me with the ~it’s fashion you wouldn’t understand~ meme, but Westbrook isn’t traditionally fashionable. Yet, he’s held up as this embodiment of capital-f Fashion in the NBA. He’s the one with the Barneys and True Religion collabs. 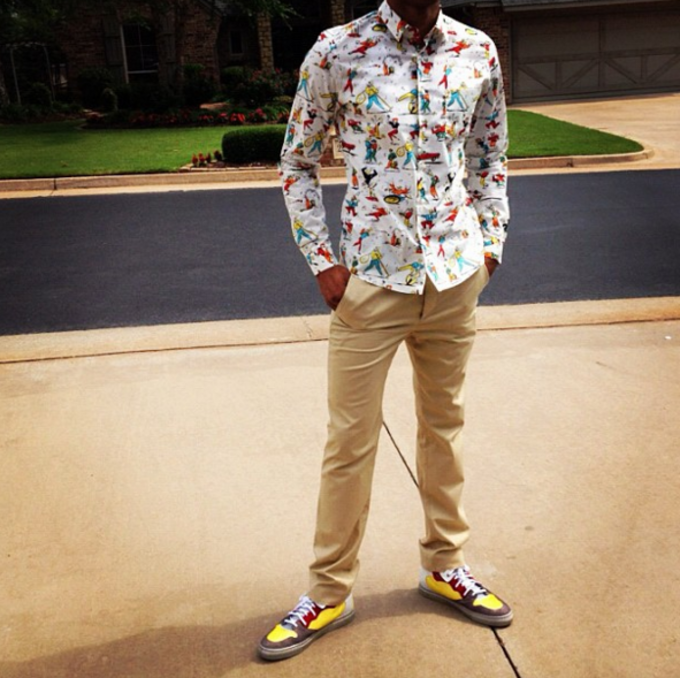 He’s the one getting dubbed the NBA “fashion king" by everyone from Sports Illustrated to Twitter. If you want to break it down, there are two major issues getting in the way of Westbrook truly reaching style icon status. The first major problem is that a lot of what Westbrook’s worn over his career doesn’t seem to fit him correctly. His pants appear painted on and oftentimes the buttons on his shirts look like they’re moments away from pressing the eject button. The second issue, the bigger one, is that he doesn’t seem to have any sense of personal style besides upping the shock factor. We seem to get a different Westbrook style all the time, as if every day is Halloween. Wearing clothes a lot doesn&apos;t mean that you&apos;re wearing clothes well. There are plenty of people who have reached style icon status by wearing clothes that no one else would dare throw on. Look at Rihanna. How many people do you see showing up to award shows wearing sheer Swarovski crystal gowns? 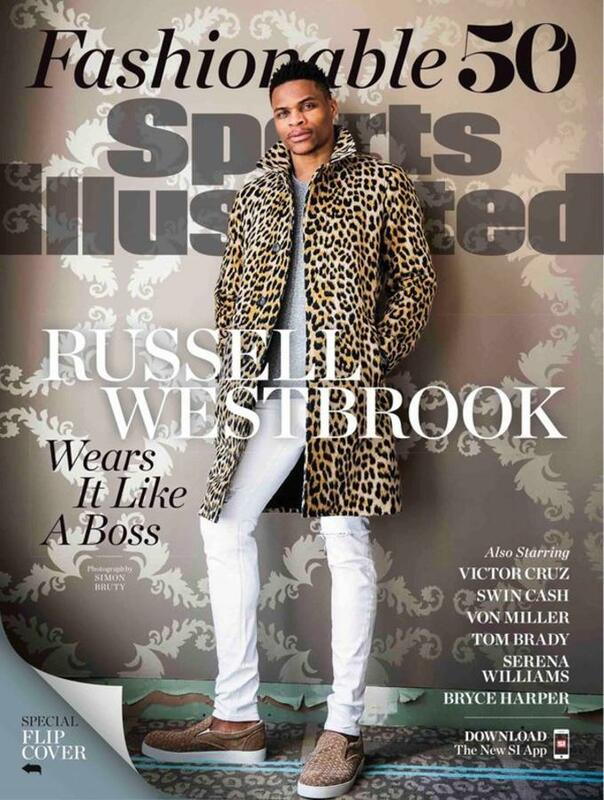 The key difference there, though, is that Rihanna wears daring clothing; Westbrook wears clothing that&apos;s crazy. A shirt ripped like his isn’t something that someone wouldn’t have the balls to wear—there’s probably a couple dads doing housework in a similar-looking tee at the moment—it’s something you wouldn’t want to wear. The proof is easy to see. Unlike Kanye West, Bieber, or A$AP Rocky—guys who appear in public wearing something and in the next couple hours it’s missing from every shelf and online retailer—Westbrook isn’t moving the needle. That’s a good measure of someone’s impact. Those are easily fixable problems, though, and Westbrook’s playing style is perfectly analogous to how he dresses. We love him because he takes risks, because he does it with confidence, and because if he cared enough to read this, he would definitely explode into a fireball and hunt me down thanks to the chip on his shoulder that wouldn’t fit in the biggest of family-size bags. But, if Westbrook could rein it in a little bit, he would be much better both on and off the court. 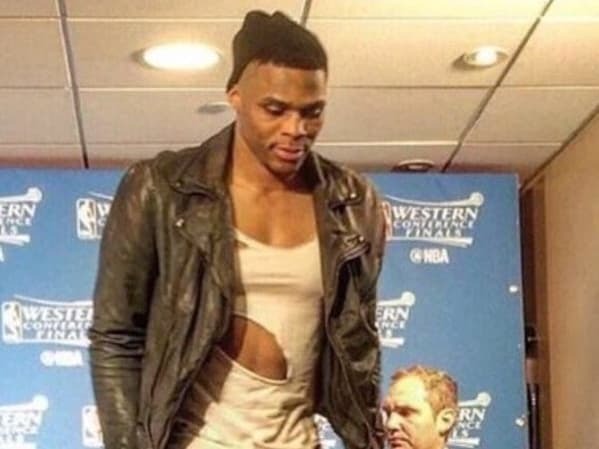 His shredded shirt is like the three-pointers of outfits, and Westbrook has the third-worst three-point percentage among players who have attempted 1,500 or more threes. Sunday night is a perfect example: Westbrook looked more normal than usual going with a simple outfit made up of a white hoodie and flannel shirt. He also shot slightly fewer threes than he&apos;s averaged this postseason. The whole thing was a win-win for Westbrook. There’s certainly nothing wrong with making it all the way to the league and wanting to stunt on everyone in existence. I can’t help but think this would be more enjoyable for him if we were laughing with him and not at him.